I love plants that give us not only colorful blooms over an extended period of time but also bright distinctive foliage that presents its own show alongside the blossoms. Canna lily is just such a plant. A handsome perennial that will thrive in gardens throughout most of the central and southern areas of the United States, the canna lilies are grown from rhizomes--fatty tuberous underground bulb-like roots. 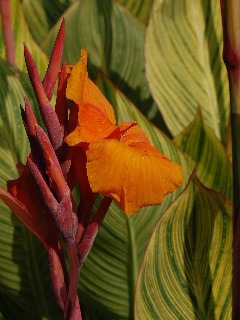 The canna lily rhizomes can be purchased at your local garden center or ordered from reliable sources on the internet. Ideal planting time is in the early to late spring after all danger of frost has passed. The rhizomes should be planted 4 to 6 inches deep with the “eyes” of the bulbs facing upward. Select a location that receives plentiful sunshine (6 to 8 hours or more daily) in order to grow healthy cannas that will produce lots of blooms. Soil should be deep, rich, loose, and loamy with plenty of moisture available to the site throughout the growing season. 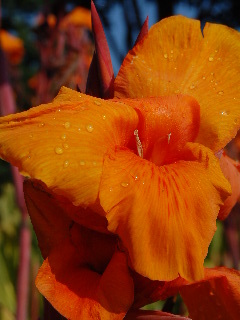 Although cannas don’t like soggy locations, they are rather tolerant of moist sites. If you are planting several different varieties of canna lilies into the same area, take note of the height that each variety will reach, and plan your layout of lilies to maximize the visual show. Canna lilies are available in varieties that will reach heights in excess of 6 feet, as well as varieties of lesser heights, on down to the dwarf varieties that will not reach more than a foot or so in height. Also, be aware of your color choices, and “paint” your flowerbed by intermingling the different colors or by grouping patches of the same colors together. Cannas are not available in a large variety of colors--primarily orange, red, and yellow--but the brightness and intensity of the colors is striking as the summer sun bounces off the blooms in your garden. As autumn approaches and the frosty mornings encourage us to wrap up the summer garden, the top foliage of canna lilies can be cut down to a height of just a few inches, and the entire surface of the bed can then be mulched to protect the canna rhizomes throughout the winter. If winters in your area are severe, with temperatures that are significantly below freezing for extended periods of time, it’s best to dig up the roots of the canna lilies and let them overwinter in the coolness of your garage or a similar environment. If the rhizomes have become quite large and rangy throughout the summer growing season, you may want to divide them in the spring before they go back into your outdoor garden. This division will encourage healthy vigorous-growing new cannas that should produce an abundance of bright blooms. The smaller varieties of canna lilies can also be potted and used indoors as houseplants.